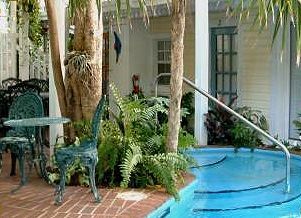 Located in the heart of the Historic District in Key West, Florida, the Garden House offers affordable accommodations just two blocks from Duval Street, and a block-and-a-half from the historic Seaport. You will feel very comfortable in our quiet location, yet you will be only steps away from all that Key West has to offer: scuba diving, snorkeling, sunset cruises, waterfront dining, Key West's active nightlife and so much more. The Bed and Breakfast offers tastefully decorated rooms in a tropical environment, with a daily continental breakfast and a nightly beer & wine happy hour - all included with the price of your room.